Etched on the walls of The Fahrenheit Group’s new office in Scott’s Addition are the names of about 400 businesses, nonprofits and government agencies. The rows read like a Who’s Who of Richmond-area organizations. At some point in the past seven years, all of them have been clients of The Fahrenheit Group, a consulting firm founded in 2010 that has grown from a two-man operation to a staff of about 80 now, branching out from Richmond to open practices in North Carolina and Arizona, while adding new services to its consulting repertoire. The client list covers a spectrum, from some of the region’s big Fortune 500 companies, to midsize businesses and startup ventures, across various industries. A sampling of the names includes utility company Dominion Energy, tobacco leaf merchant Universal Corp., grocer Ellwood Thompson’s Local market, work apparel supplier supplier Ukrop’s Dress Express, ice cream retailer Gelati Celesti, and craft brewer The Veil Brewing Co. Its clients also include such startups as food ingredients maker Nutriati and educational software maker Zoozil, as well as nonprofits like the Virginia Historical Society. There are some out-of-state businesses, too, like Canyon State Bus Sales of Phoenix, a testament to Fahrenheit’s branching out beyond Virginia. “It’s a little bit of everything,” said Keith Middleton, Fahrenheit’s co-managing partner. An accountant who previously worked in corporate finance for large companies such as Performance Food Group, Middleton teamed up in 2010 with recruiting industry veteran Rich Reinecke to co-found Fahrenheit. Both were looking for career transitions, and they had been introduced by local entrepreneur and angel investor Karen Booth Adams. After meeting over “a plate of wings and two beers,” as Reinecke recalls, they decided to go into business together. Adams became an investor for Fahrenheit. The firm started out doing mostly finance and accounting consulting. It still does, but its offerings for clients have steadily expanded, along with its staff. “It is interesting how over time, our organization has evolved,” Reinecke said. Although the firm started out consulting mostly for larger companies, Middleton said it has become a “solid middle market” consulting firm, working mainly with midsize companies, along with some startups in the area that subsequently have grown. In that role, the company has helped a lot of startups in the area, and it has been involved in the renewed focus on the startup ecosystem since the economic recession. Fahrenheit’s services now cover the entire life cycle of a business. For new ventures and midsize companies that cannot justify the expense of a full-time chief financial officer, Fahrenheit has a team of “fractional CFOs” who do that work for clients part time. When businesses reach the point where they need to hire someone as a CFO, or hire other C-suite executives, managers or specialized professionals, Fahrenheit has a search and recruiting team that can look all over the country for candidates. When companies reach the point of considering a sale, one of Fahrenheit’s most recent additions is an investment banking practice. Middleton and Reinecke say the firm has followed a natural path of development. 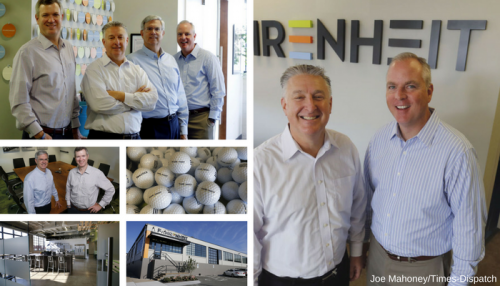 Fahrenheit’s evolution has been a mixture of organic growth and acquisitions. In 2012, Middleton and Reinecke bought out their original angel investor group, and the next year the firm expanded its advisory services into strategic consulting and financial development for startups and midsize companies. It added human resources consulting in September 2014, when it merged with Axeo, a human resources business based in Northern Virginia. That merger included the addition of a practice in Phoenix. A year later, in September 2015, Fahrenheit established a branch in Raleigh, N.C.
“We wanted geographic expansion,” Middleton said. “The Raleigh and Durham area is a car ride away,” and it has similar middle-market companies that Fahrenheit can serve. The executive search practice has become a bigger part of the firm’s overall business, now generating about 20 percent of its revenue. In January 2016, Fahrenheit acquired Bencks & Co., a boutique executive recruiting firm founded by Russ Bencks, who is now Fahrenheit’s managing director for a six-person team that conducts 60 to 80 executive searches a year. Fahrenheit’s second-longest tenured employee is Doug Jones, who joined the firm in 2011 after a career as CFO for privately held companies mostly in the construction and real estate industry. “I had always had a hankering to do consulting,” said Jones, who is now managing director in the firm’s fractional CFO and controller practice, a job in which he travels around the Richmond region providing finance and accounting work for various clients. Clients include Trolley House Refreshments Inc., a Henrico County-based company that operates vending and food micromarkets for corporate clients and owns a catering service. For the next step in its evolution in 2016, Fahrenheit turned to Jonathan Brabrand, who had nearly 20 years of experience in investment banking and sell-side mergers and acquisitions. Since March 2016, he has been managing director overseeing Fahrenheit’s private equity and investment banking practice, which helps companies at the stage where the owners are looking to sell the business. A major part of his job now is to help business owners think about their exit plan. Clients of the investment banking practice have included The Coleman Institute, a Richmond-based outpatient addiction treatment center, which earlier this year engaged Fahrenheit to structure a negotiated sale to Texas-based BayMark Health Services. Earlier this year, Fahrenheit made the move from its former office in Henrico into a new 6,500-square-foot space in Richmond’s Scott’s Addition area. Fahrenheit became the first tenant to move into the renovated HandCraft Cleaners building, a mixed-use development with other businesses such as engineering firm Hazen and Sawyer; architecture and design studio 510 Architects; and Evatran, a maker of wireless charging stations for electric vehicles. “It is a cool area,” Reinecke said of Scott’s Addition. “And it is a convenient to everywhere.” It also puts the company in the middle of the Richmond region’s hottest area for craft beverage makers. The HandCraft building houses one of them, Vasen Brewing. Fahrenheit’s colorful office space includes a large conference room and several casual meeting areas, and a large kitchen area with dining booth tables. The Fahrenheit space also houses an office for the Virginia Council of CEOs. Click here to go to the Richmond Times-Dispatch website and see the full article.